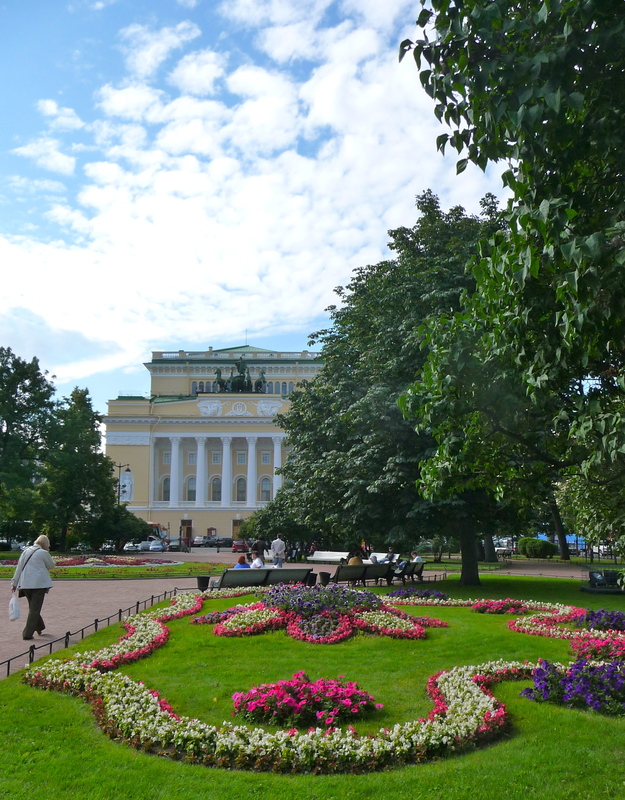 We exited the Metro at Nevskiy Prospekt, one of the main streets of St Petersburg. Women navigated brick and cobblestone sidewalks in 5-inch heels. I held my breath as they clicked along, anxious that one would catch her stiletto in a crack and tumble. It never happened. Old babushkas stumbled along slowly, hunched over from the weight of years of hard labor. One store window contained brightly colored jerseys of the Russian Olympic team with bold swirls of red and blue. Another contained layers of ecru, pink, and lime green macaroons arranged in a Christmas tree formation. Yet another advertised dozens and dozens of matryoshkas, the brightly painted, stackable wooden dolls. 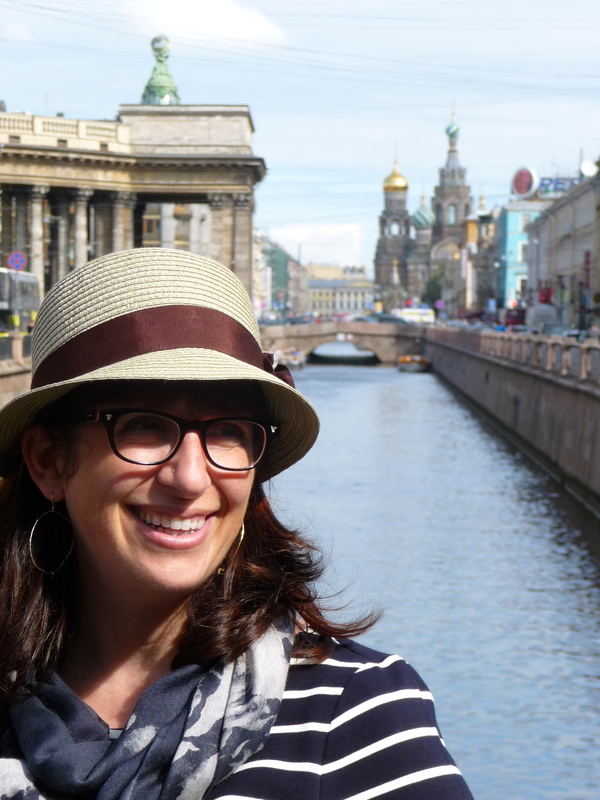 We crossed the street and entered Ostrovsky Square, greeted by men and women hawking river tours over loudspeakers, flanked by vendors selling soft drinks and ice creams from mobile carts. 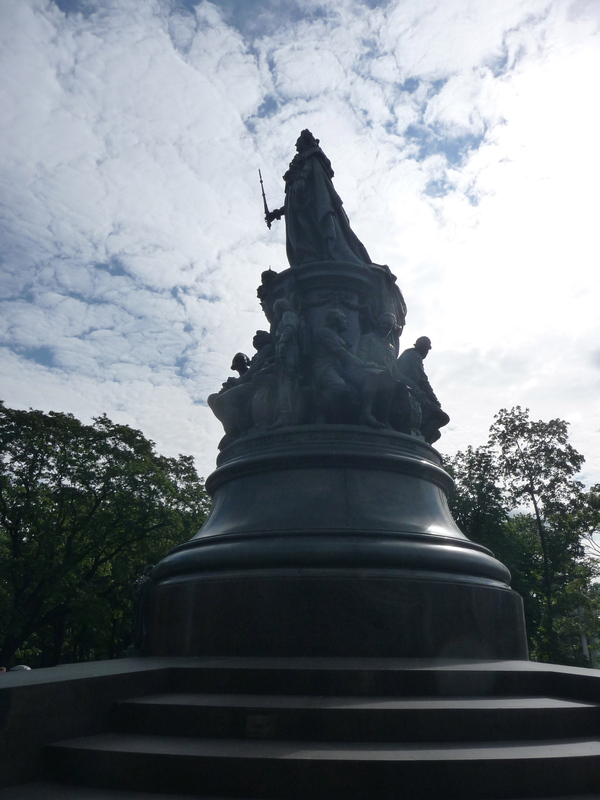 We entered the park, walking around a huge statue of Catherine the Great and her advisors, towards the Alexandrinsky Theatre. Beds of bright pink, purple, and yellow flowers bloomed along the path, making the overcast day seem brighter. 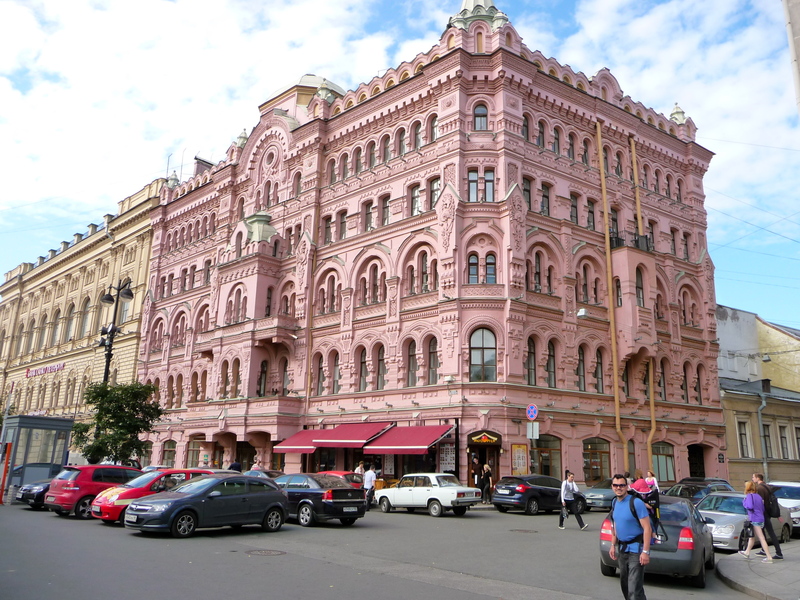 We rounded the corner and were met by huge buildings which Stas described as neoclassical Russian architecture, but I dubbed wedding cake architecture. Floors and floors of buildings sat like layers of cakes, decorated by multiple arches and curlicues. Some were pink, some white, some pale yellow. It was as if we were walking through aisles of a bakery, only instead of cakes, we were viewing buildings. And so many beautiful buildings! Around every corner we saw a building even more beautiful than those we had just passed. We’d stop and point and ask, “What’s that, Stas?” He’d look, and more often than not say, “Offices. Administrative building. Business.” Nothing out of the ordinary happening there, yet stunningly beautiful. Stas led us to his favorite bridge, the Bankovsky Bridge, a tiny pedestrian bridge with griffins guarding each side. As we walked across, he instructed us to look in the distance. There it was! The Church on Spilled Blood! The famous Russian Orthodox church that looks like it’s made of candy. 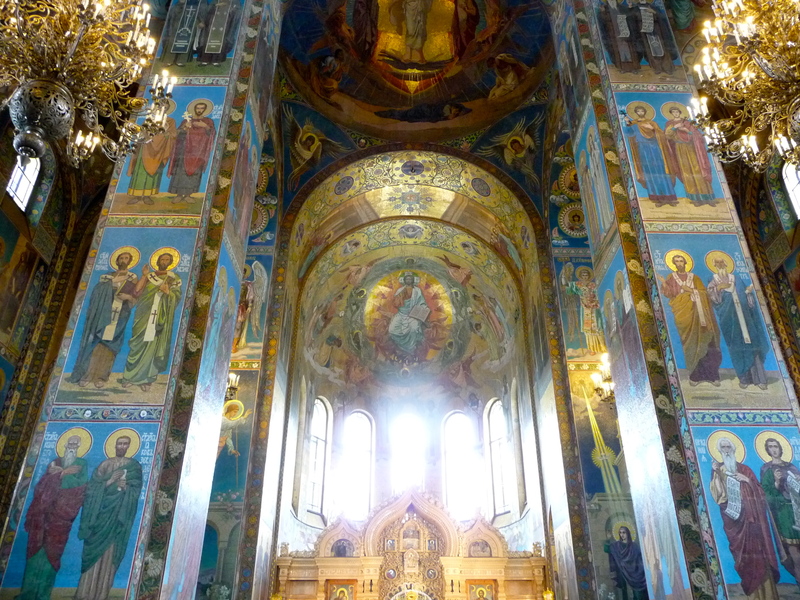 It’s called the Church on Spilled Blood because this was the exact spot where tsar Alexander II was assassinated. 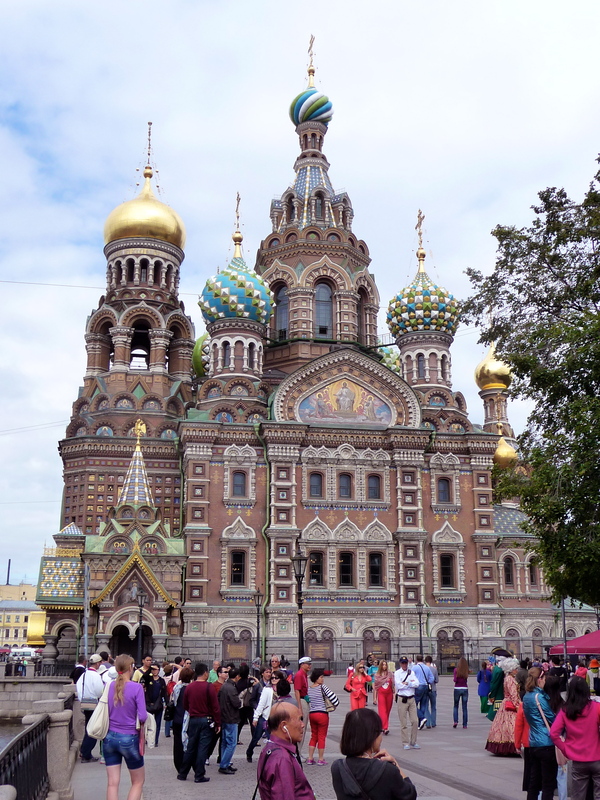 My first introduction to Russian Orthodox churches was at Disneyland when I was a young girl. One of my favorite rides (despite the annoying theme song) was “It’s a Small World.” Replicas of Russian Orthodox churches soared behind little Russian children mouthing, “It’s a small world, after all….” I remember thinking that if such buildings really existed, they must be the most beautiful in the world. The colors! The angles! The towers! At some point years later I realized that yes, the buildings were real. In my mind, I thought, “I’d love to visit one in person.” And now I’m here! I stared up at the towers, marveling at the colors and the intricacy of the design. It’s magical. Every bit of the building is beautiful. As I walked in, I stopped and gasped. As beautiful as the outside is, the inside is even more so. 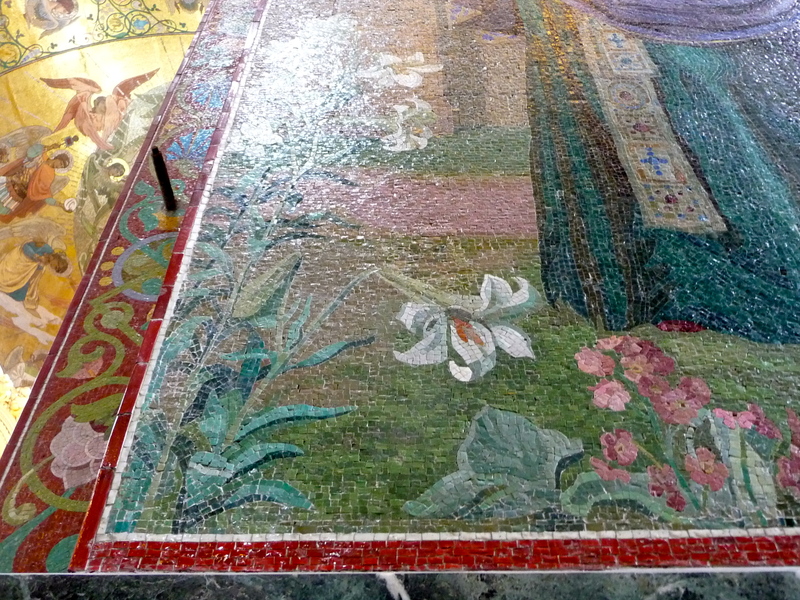 Every surface is covered in mosaic. My eyes rose upward, staring at the brilliant jewel toned tiles that made up pictures of saints on each of the columns. I stood, enjoying the silence of the church, marveling at the craftsmanship and ingenuity it took to create such a spectacular memorial. I backed away, then came close to each mosaic. I shifted my position slightly to see the play of light on each tile. I walked around, then came back again. I closed my eyes for a few seconds, then opened them, each time amazed at how stunning the space continued to be. After a long while, I exited the church, turning one last time to stare. And smile.